On March 25 and April 1, the third annual River Ranger environmental education program was held. A total of 56 youths registered to participate in this unique experiential learning opportunity. 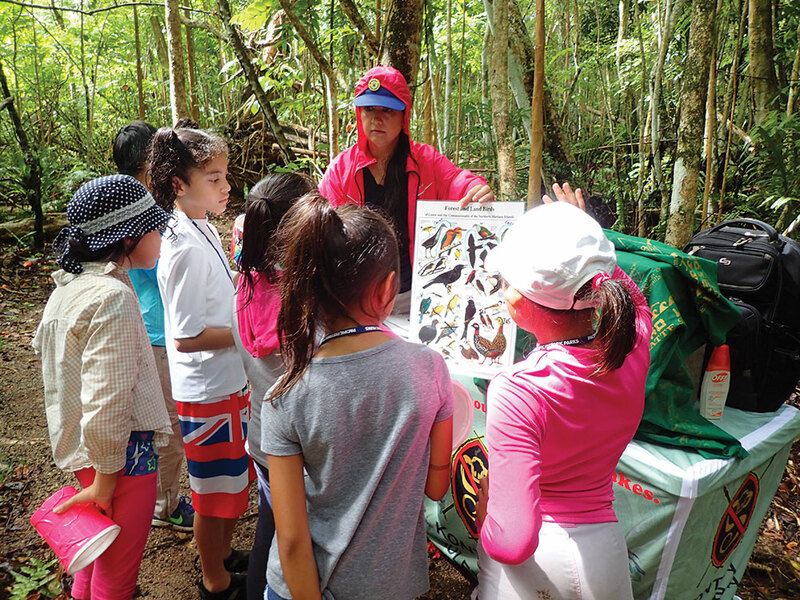 At each of the River Ranger sessions, third and fourth graders learned about freshwater ecosystems at Masso River, located in the Piti Guns unit of War in the Pacific National Historical Park (WAPA). The curriculum objective was for the River Rangers to learn about the importance of our river ecosystems. We emphasized the fact that freshwater resources are limited and that freshwater is essential for human, plant and animal survival. 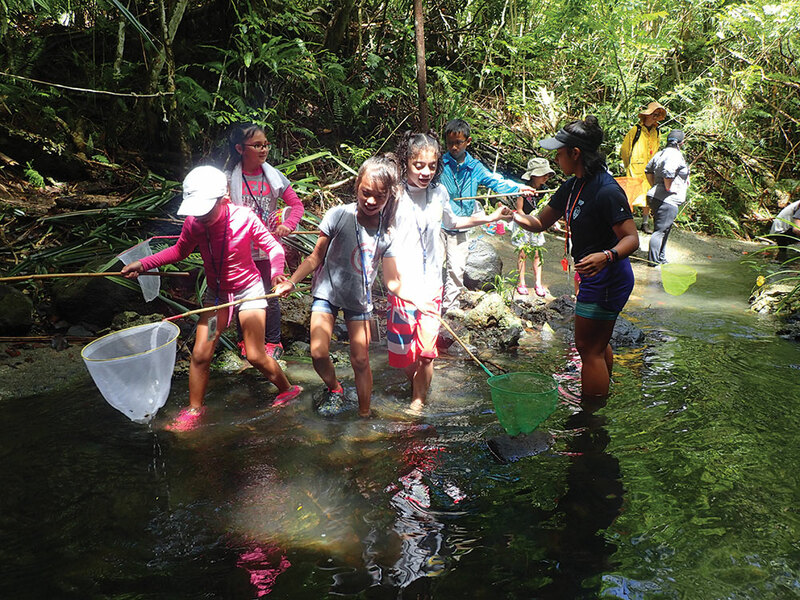 One activity illustrated how precious freshwater is and introduced participants to the rivers and other freshwater resources that we have here on Guam. This activity proved to be effective, because the youths were not aware of how limited clean freshwater actually is. During the river walk, the River Rangers were split up into groups and visited three stations. The first station featured a kick-net that National Park Service employees use to survey freshwater creatures in Masso River. This station was manned by agency partner Brent Tibbatts from the Guam Department of Agriculture. 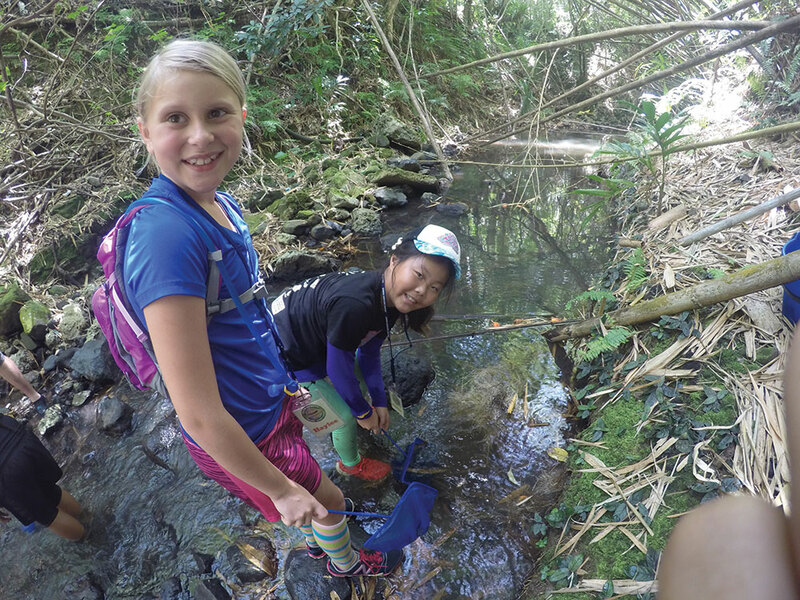 The River Rangers collected creatures like freshwater shrimp and snails and learned about each of them and how they contribute to the river ecosystem. 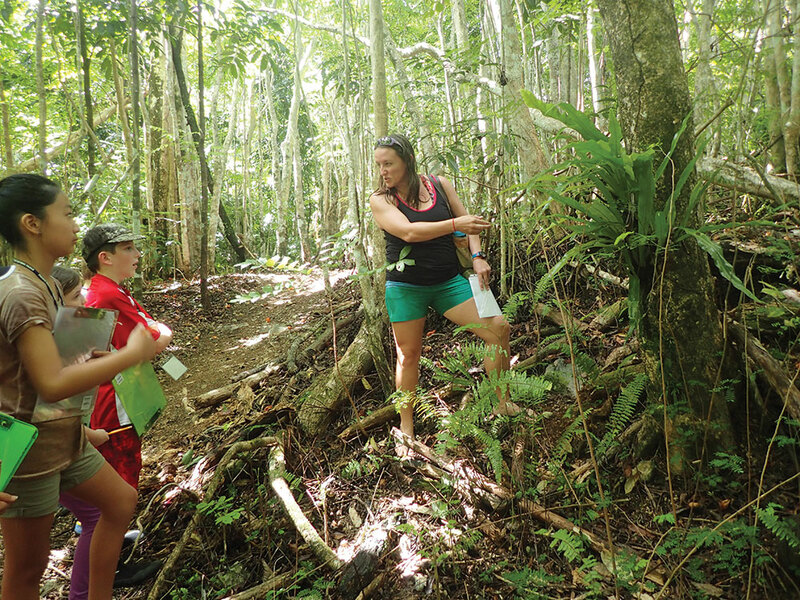 The second station, managed by Anna Simeon of the Guam Bureau of Statistics and Plans’ Coral Reef Watershed program, involved walking around the river and learning about native plants and animals that live there as well as invasive plants. During the second session a change had to be made, because the presenter was ill. Another partner, Jane Dia from the Guam Department of Agriculture, talked about native birds that should be living in and around the river; but, because of the invasive brown tree snake, we no longer have those native birds. At the third station, the River Rangers used hand nets to try and catch fish and shrimp. Then our presenters — Pacific Historic Parks Education Coordinator Tanya Sortor and Sean Moran of the University of Guam Sea Grant Program — talked about different freshwater fish and eels that can be found in the river. The River Ranger environmental education program was largely supported by the maintenance division at WAPA. The maintenance crew, under the direction of Christopher Cruz, cleared the trails prior to the event and even assisted during the program. The 2017 River Ranger sessions were a huge success as seen in the evaluations from the participants and their parents. The following are some of the youth’s responses. One said: “My favorite part about River Ranger was catching snails and shrimp.” Another said: “My favorite part about River Ranger was going in the river and climbing the rope up and down.” Other River Rangers replied that they can help Guam’s freshwater by “not polluting the water with trash,” “not spilling chemicals or other liquids that do not belong” and “by taking short showers.” In an online evaluation sent to parents, all responses indicated that they were very happy with the curriculum. They asked for more sessions and were happy their children got this exposure to a fun and engaging environmental protection program.